Positive workplace culture is contingent upon a flow of information that is known among all team members. A company or human resources department that does not disclose all information legally allowed to be distributed to its employees is one that is bound for failure in the long run. 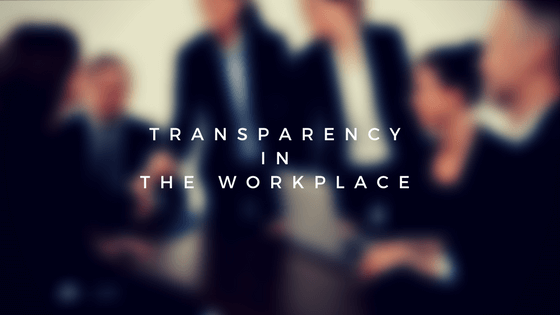 Transparency is a key ingredient in a successful business, as all employees are better informed, thus having the information necessary to make smarter decisions. Additionally, those who are given details of their company’s future, its goals, and the specifics of its operations are more inclined to voice their opinions and possibly bring forth innovative ideas. A level of trust also comes with being transparent with one’s staff members. For larger companies, it may be difficult to simply decide to start being transparent with their employees once they’ve realized there is room for improvement. Internal communication can be tricky if certain pieces of information should remain private, but there are options. Messaging platforms for example, are extremely beneficial in providing an instant connection between colleagues. They are also great for promoting collaboration and education among all team members. Managers that are readily available for all questions or concerns not only spark trustworthiness among their employees, but are also in the loop with any potential issues that may arise within their team. Holding face-to-face meetings that include all members of the company, regardless of size, is another effective strategy of promoting transparency in the workplace. Company wide emails can get the point across, but have little to no personal connection. When all team members are present, the possibility of misunderstanding the information given decreases tremendously. Employees are there to ask questions or voice their concerns, whereas sending important notifications via email leaves room for error and misjudgment. Continuing with the subject of meetings, managers should always leave time for questions, concerns, or suggestions from their employees, and should take any of each seriously. A business that acts on its employees’ suggestions or concerns has the potential to greatly increase its employee retention rate, as well as improve the business as a whole. When managers and business owners are transparent with everyone within the company, better solutions are offered, staff members are much more likely to engage in the company’s goals and objectives, and the relationship between manager and employee is improved. According to a 2014 survey conducted by CareerBuilder, 37% of those interviewed said they would willingly change their jobs because of a poor opinion of their current bosses’ performances; something that can be easily mended by a transparent leader.